The UltraSync 4G LTE Cellular Module for UltraSync Self - contained Hubs offers an optional, cost effective means of providing uninterrupted wireless communication between the hub and central monitoring station. The UltraSync Cellular Module can be used as the primary method of reporting or as a backup in installations where TCP/IP communication is also being used. The module fits neatly into a compartment that’s easily accessed on the backside of the UltraSync Self-contained Hub. Installation is simple, should upgrades be necessary in the future. 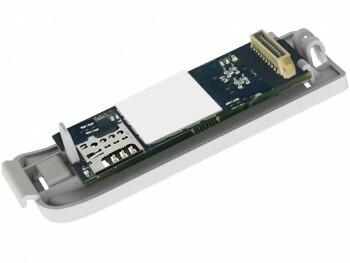 The UltraSync Cellular Module features a multi-network radio, capable of connecting to many of the major national carriers as well as a number of smaller regional carriers. When combined with the UltraSync platform, the system provides an end to end monitored connection. The radio will attempt to reconnect to an alternative network automatically if problems are detected with the current network connection.